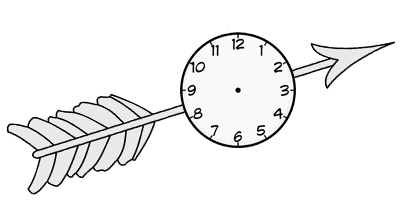 Can we reverse the arrow of time? Many in the past have tried to reverse it, many have tried to keep it stationary, but all of them have failed from Hiranyakashipu to Ravana to modern atheistic scientists. Hiranyakashipu, a demonic king of bygone ages, vainly attempted to become immortal by circumventing the laws of nature. Ravana also made a similar attempt, but he was vanquished by Lord Rama. Modern scientists make futile claims about their attempts to stop growing old. They even dare to say that they can reverse the aging process ”Future technology will help an old man grow young!” All sham. Aging is not the only way by which people die. There are innumerable ways in which people meet their end: accidents, wars, suicides, murders, terrorism. Can the scientists reverse the dying process? The struggle for existence leads to survival of the fittest, but how long can the fittest survive? Eventually relentless time wins over them, and they too become a part of history.